Just thought I'd share some pictures from Tyler's birthday and our short trip to Las Vegas a few weeks ago. Thanks to my dad for taking all of these. His party was held at a park, and I knew I was taking my chances with the weather. However, it turned out perfectly! I think it was high 60's and sunny. 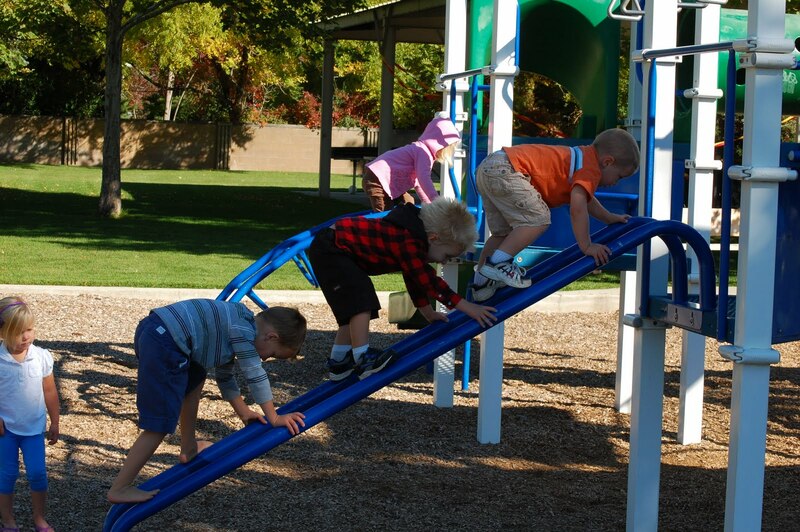 Here's Tyler playing on the playground with some of this good friends. We only invited a handful of kids because I cannot handle the chaos that comes from more than that. 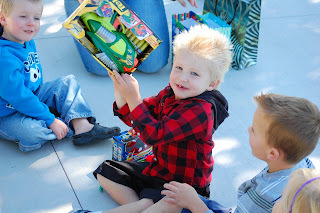 Plus Tyler gets too overwhelmed when there are a lot of kids around, and I wanted him to enjoy his party without feeling stressed. 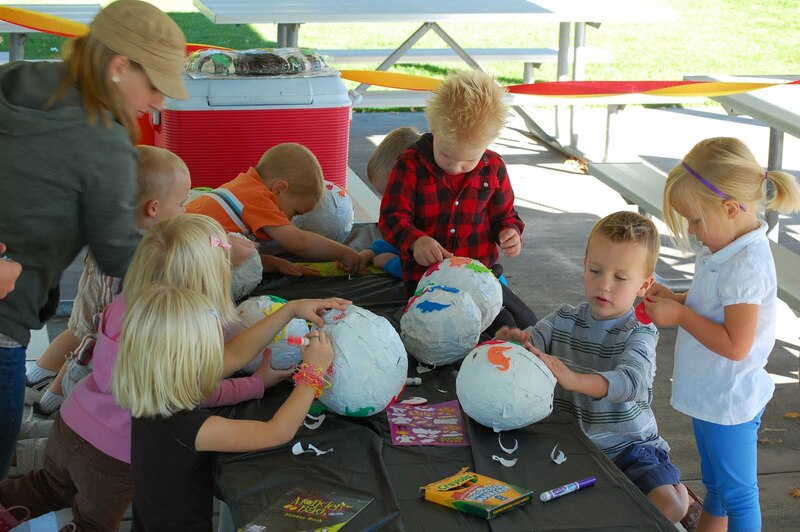 Before his party I made "dinosaur eggs" out of paper mache. They didn't turn out quite as I pictured, but fortunately kids have great imaginations. We hid them around the park and then after they each found one they got to decorate them. Then when they took them home they were supposed to crack them open to find their prizes. At the end Jeremy had all the kids line up with their legs apart to make a "Spanking Machine". Then Tyler crawled through all their legs and they spanked him when he passed by. It was really cute! As far as presents go we didn't get him much, but what we did get him both he and Jeremy were pretty excited about. It's a model Rhino. It's even black, just like ours. While I have 6 nieces and nephews on Jeremy's side, this is my first on mine. She was born the beginning of September and she is just tiny and precious. 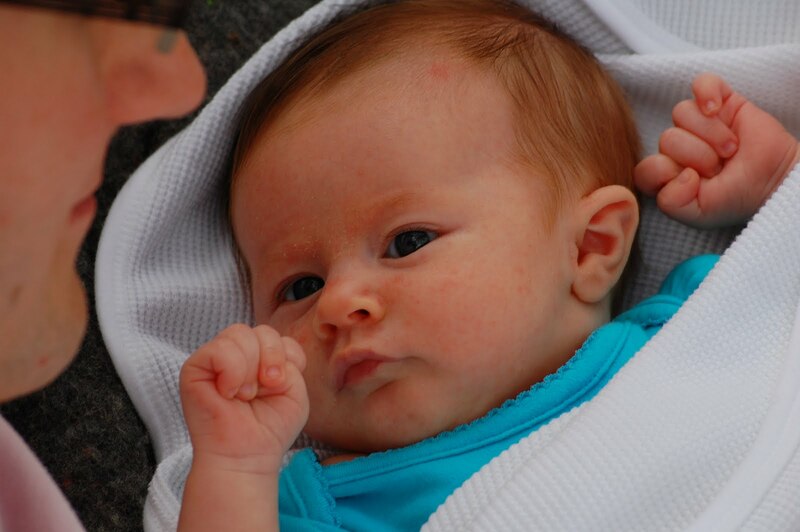 She's one of those babies that I think looks very girly--it's probably her lips. Those she gets from her mom, but her eyes are all her dad. Aren't they a cute little family? 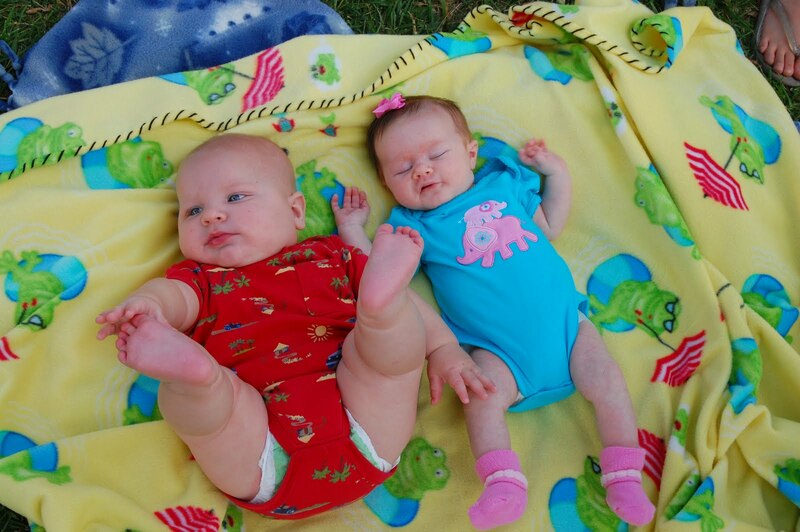 I love this picture because Celeste has her arms up under her chin, I love it when babies do that! My whole family, with the exception of Peter. The guy next to my brother Aaron is my sister Rachel's fiance, Nick. 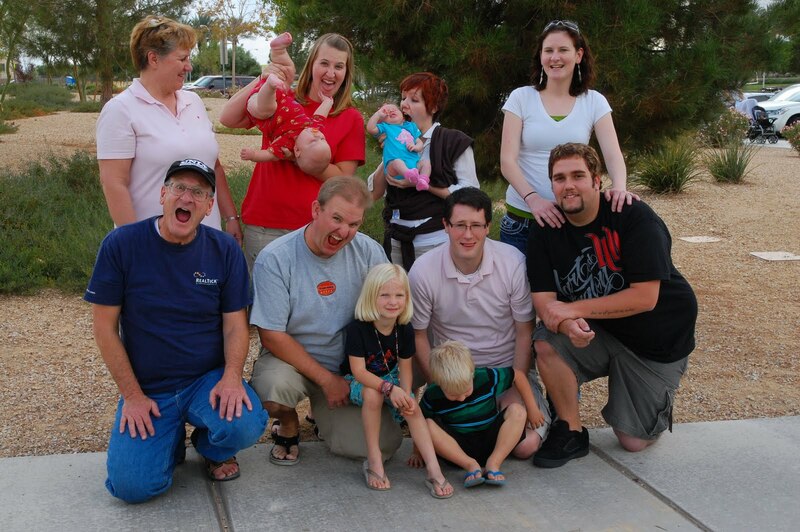 Family tradition: goofy picture after the normal one. Not everyone got the memo. Just the kids and the grandkids. Then we took some with Ryan and Celeste, he's just 3 months older than her. But he's extremely large and she's extremely petite. He had his legs up through the majority of the photo shoot, but if you had his thighs you would too. You know how there are a lot of things that you don't appreciate as a kid but later learn to as an adult? This post is about one of those things. A few nights ago I went on a tirade against modern day Halloween. I was spouting off about how it's such a shame that costumes all seem to be store bought, and it's to the point that kids are embarrassed to wear homemade costumes. "What happened to the good old days of just gathering whatever crap you had lying around your house and throwing it together into a costume?" I spouted to Jeremy. The irony of my tirade will probably become apparent in the following pictures. I too, as a child, was sometimes embarrassed to wear a homemade costume. Sorry to say it Mom, though I'm sure you aren't surprised. Here I am, 5 years old, dressed as a pumpkin. Some butcher paper and a stapler. And whatever that thing is on my head. 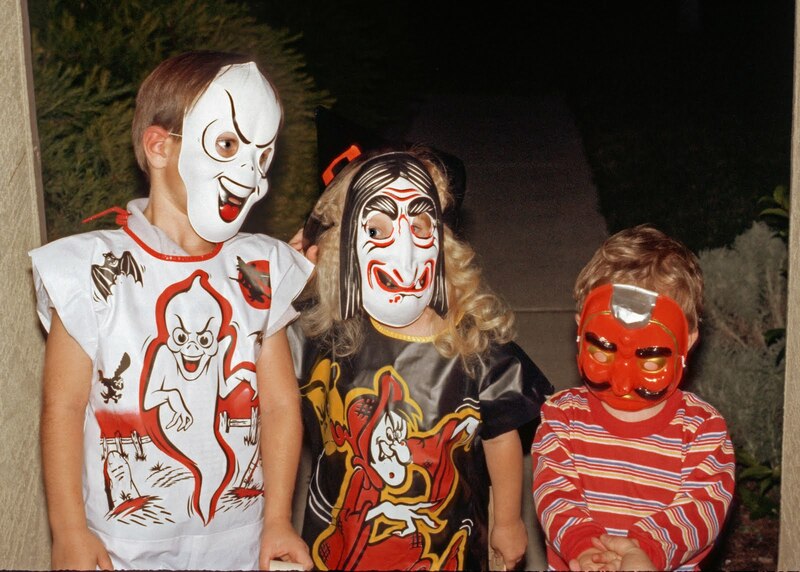 My younger brother there in the middle is a devil--this is a recurring theme. My older brother--well, what is that? Here's the next year, 1988. My older brother is a tourist, I especially love the sunblock on his nose. We've got a little Super girl down there, and again the Devil. I'm pretty sure he's the only one that ever got to pick what he wanted to be for Halloween. And then there's me--this costume is recycled from the previous year. Tic-tac-toe drawn on my face, fuzzy dice earrings, a deck of playing cards glued to a headband, a checkerboard in front and who even knows what was in back. Do we have a name for this costume? I'm pretty sure this falls under the "gathering whatever crap you had lying around your house and throwing it together into a costume" category. 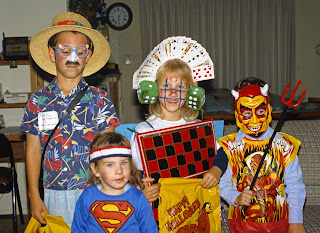 Here's an example of some store bought costumes, frankly I don't think they're any better than the ones my mom made us. Notice my younger brother as a devil, again. This time he's a ninja. That's a little better I guess. 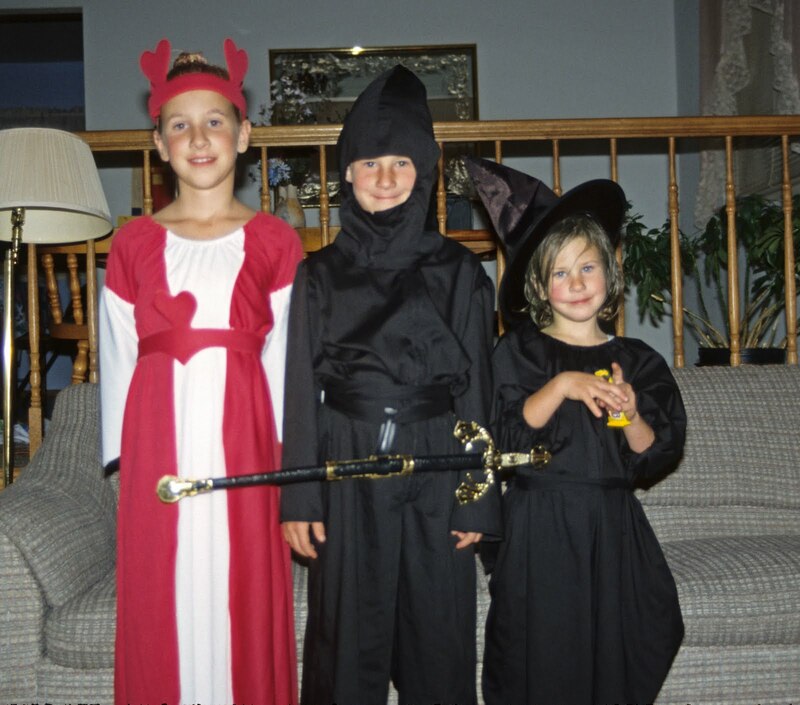 My sister is a witch and I'm the Queen of Hearts. 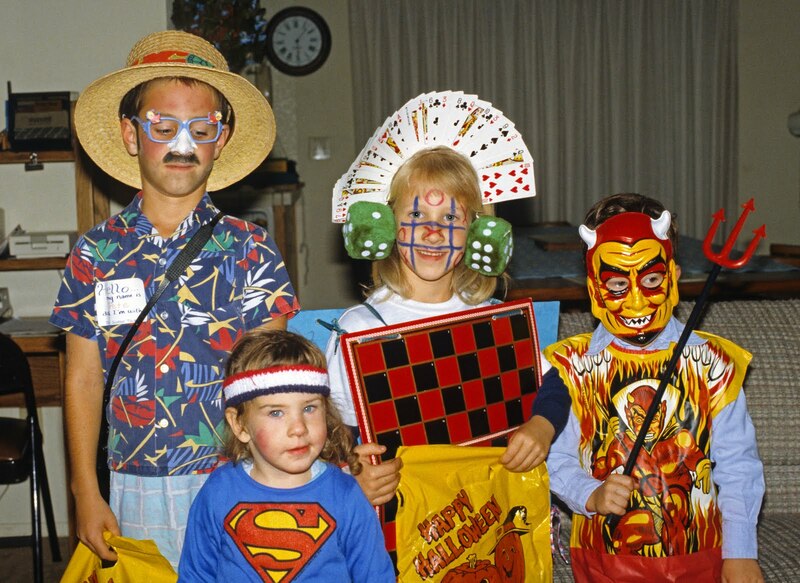 This is 1991, I think my mom gave up trying to make costumes because she couldn't top the previous year. Keep on reading, you don't want to miss the previous year. 1990--the picture below. My older brother was 9, I was 8, my younger brother was 6, and my sister was 4. 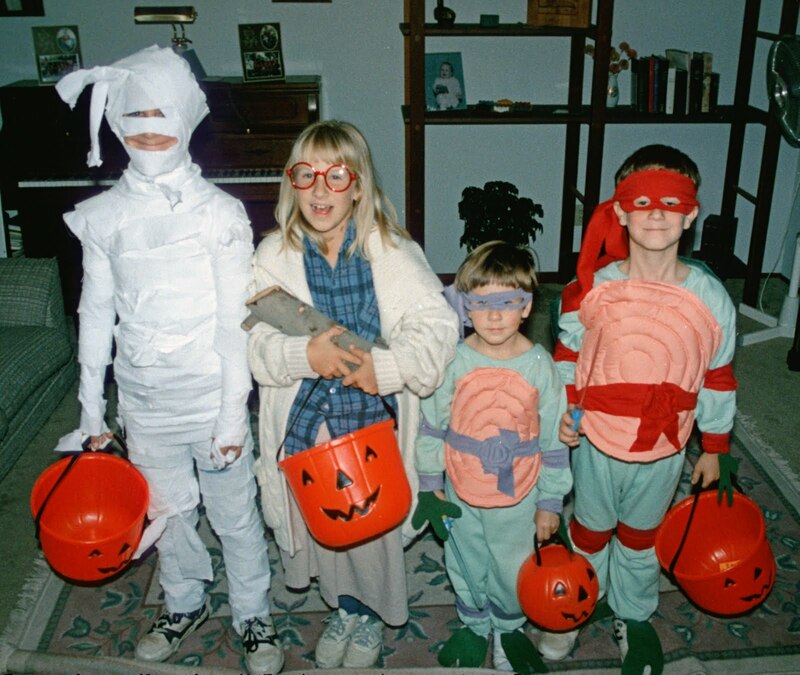 Obviously we have a well wrapped mummy and two ninja turtles--Donatello and Raphael. I can clearly see kids asking to be those three things. What I can't see, and I'm pretty sure didn't happen, was me asking to be what I was dressed as that year. I'll give you a minute to guess. I'm wearing a skirt, an over sized sweater, and gigantic red rimmed glasses. Oh, and I'm carrying a log. A LOG! As in, a piece of wood that you put in your fireplace. You can't guess? In 1990 there was a show called Twin Peaks that my parents watched. I never did because I think I saw a minute of it once and thought it was scary. But on the show there was a character that I only know of as the "Log Lady". As far as I know she was a creepy lady that carried around logs. That is what I dressed as for Halloween when I was 8 years old. And for Christmas that year I probably asked for a foot bath. Just so you know, I did carry that log with me while trick-or-treating. I figured it explained the costume and without it I just looked like a grandma. I'm not positive, but I think dressing up like a grandma for Halloween is even worse than dressing up as the Log Lady. So, what do I now appreciate that I didn't as a kid? 1. 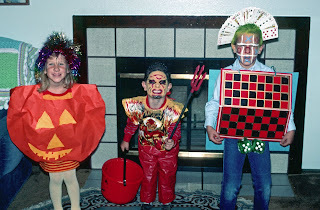 All the effort my mom put into making creative costumes, something different than other kids were wearing. 2. The fact that a few short years after these pictures were taken my mom called it quits and just started buying us candy the day after Halloween when it was on clearance, so that she wouldn't have to make costumes and take us trick-or-treating. How many years until I'm allowed to do that? 3.The Log Lady costume. Yes, I think I actually appreciate it now. Though that log really was heavy! And at the same time, I do appreciate store bought costumes. It makes all of our lives easier--and a little less embarrassing. A miracle has occurred and I have a minute to sit down and blog! The month of October has absolutely flown by, and I just realized that I have one week to figure out Halloween costumes and come up with some sort of game or craft to do at Alexis' class Halloween party. 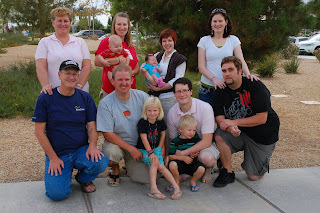 Last week we had Tyler's birthday and a quick trip to Las Vegas to visit my brother, sister-in-law and BRAND NEW niece. Pictures of all that to come soon. Since we've been back I've worked hard to get the house back into some sort of order because it was beyond crazy for awhile there. On Tuesday I scrubbed my kitchen floor, on hands and knees for at least an hour. ONE HOUR! I can think of many, many other things I'd rather do for an hour, but it badly needed it. So here's a bunch of random stuff about our October that I feel like sharing. We took another cousin picture with all the kids on Jeremy's side of the family. 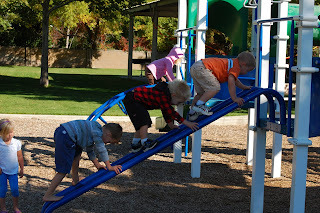 This always proves to be a difficult task, but fun too. For those of you who know his family and are interested in who all these kids belong to, let me tell you. 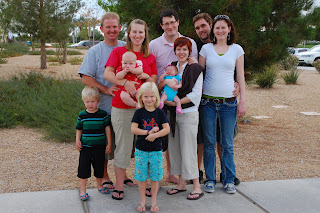 To the left of Alexis are Melanie's three boys: Mason (5), Peyton (3), and Tanner (6 months). 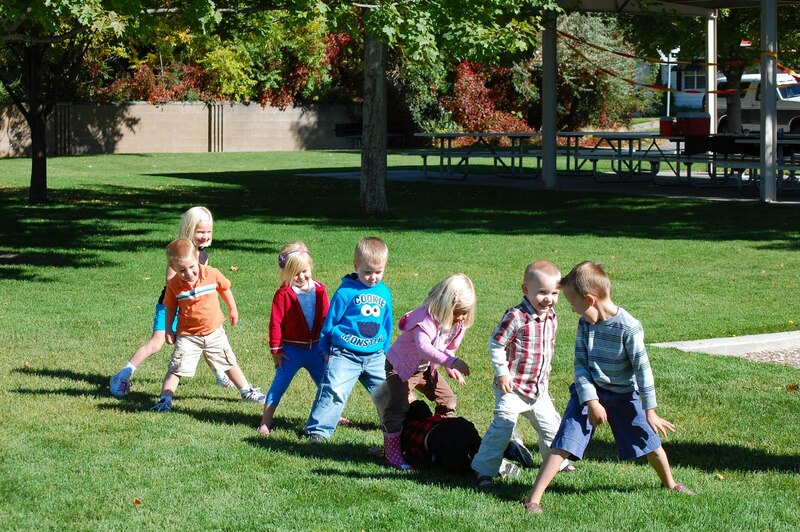 To the right of Tyler is Shelise's daughter, Kylee (2) and her son Dallin (5). 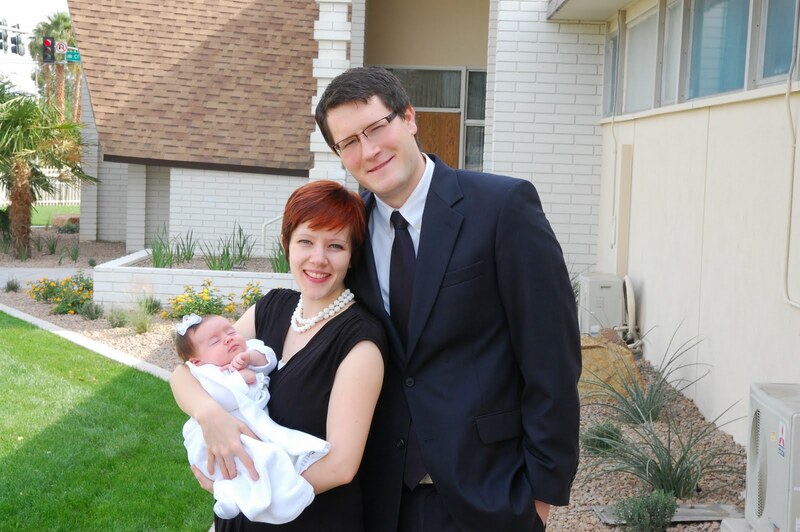 Dallin is holding Justin's daughter Katelyn (7 months). I cannot express how happy it makes me that my kids have cousins they see often and that they love to play with. I did not have the same growing up, and I'm so glad they can. Here's a shot of the three babies. Heaven help us all in about a year when they start stealing toys from each other and generally acting crazy, as 1 1/2 year olds do. And Heaven help Katelyn in about 3 years when Ryan mauls her every chance he gets (that is, if he grows up to be anything like Tyler). Ryan seems to have pinned his arm under his torso and can't push himself up. These are the kinds of trials you endure when you weigh one zillion pounds. Actually, he weighs 19 pounds. That is 97%, my friends. He is by far my biggest baby, and also my baldest. He had hair, it was blond and hard to see, but it just grew in wisps and definitely not even across his head, so I told Jeremy that I was finally on board with him buzzing it. He jumped at that and yesterday while I was at the store he buzzed it all off. He looks much better, but you have to look at him closely to even notice that he has hair. Jeremy didn't save any of the hair for his baby book, he just washed it down the drain. So we will pretend that it was not his first haircut. Does that even count as a first haircut anyway? I just finished reading a doozy of a book called "Follow the River", the author is listed over there on my side bar. And when I say it's a doozy, I mean it. Don't read it if you are pregnant, have a newborn, or are particularly emotional. There were many times I thought about quitting, but it's our book club book for the month, so I forged ahead. I'm glad I did, but it seriously saddened me. Does this picture scare you? It scares me. That's a place in St. George that I know of as "The Crack". Here's a picture of my sister-in-law, Shandy, and I in it, taken from above. That was a few years ago. This last weekend we stopped here on the way home from Vegas to let the kids run around. I tried to go through it with Alexis, but I didn't fit. She likes to point out that I've gotten fatter. While that's true, that's not why I can't fit--it's actually because I'm a nursing mother. Too much information for you? Sorry. I love this picture because it makes Alexis and Tyler look like they're the same size. Alexis is actually taller than Tyler, but I doubt she will be for much longer. Also, Tyler is wearing Dickies shorts that Jeremy found at Wal-Mart for $4. I love them because they are tough and durable, and cute. Also, Jeremy has about 500 of those shorts in his size, so now Tyler really is just like his daddy. A jello cup, a granola bar and a napkin that says, "Have a Thantastick Thursday! Mom! Love Alexis". It made my day, especially because yesterday I was feeling like a jerk of a mom. The best part is that she knows the word Fantastic begins with an F, but she wanted to make up a word to go with the Th in Thursday. What a clever girl! Now I hope you all have a Thantastick Thursday as well! Anyone want to trade me their cookie for my jello cup?? It's been a busy week, and this next week is going to be even busier, but I was looking at pictures that encouraged me to write a bit about my Ty-guy. He'll be 4 on Wednesday. 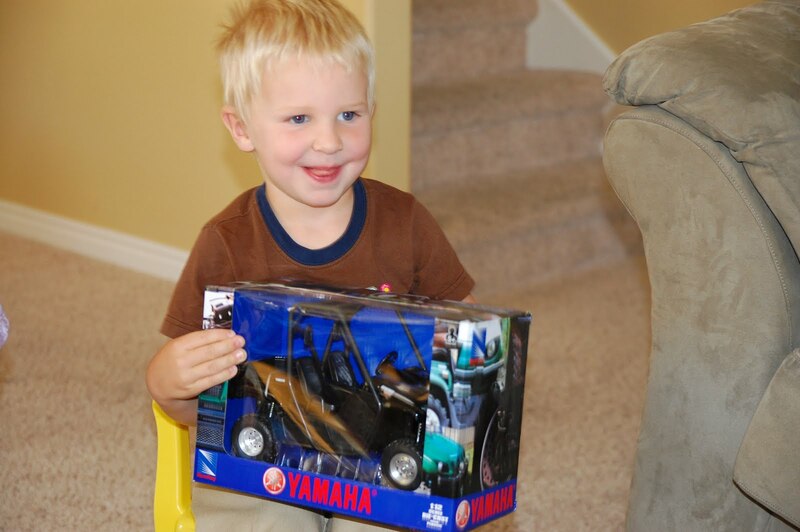 Like all birthdays my children have, this one has crept up on me and I simply cannot believe he is really 4. I still think of him as my baby (even though I have an actual other baby) but he in fact isn't a baby. He is less snuggly. He doesn't kiss me and hug me like he used to. He knows things only big kids know. He can ride a bike with no training wheels. He knows how to use a mouse and an iTouch. He can sit and listen to long books. He knows songs--though he won't sing them. He is really getting old. Here are four recent pictures that show so well who Tyler is. This first was taken last weekend as we celebrated all the October birthdays in Jeremy's family-Tyler, Ashley and Mike. See the face Tyler is making? That's the face he makes when people are looking at him and he's gotten shy. He sticks his tongue out like that and makes a funny little smile. He also does it if he thinks you are laughing at him. Here he is playing a dinosaur game that his grandma gave him. He loves his dad, and he loves dinosaurs. Therefore, this is like heaven for him. Worn hole in his pajamas--toe sticking out. Raggedy nails (please don't judge me for those), and dirty toes. Plus a fist full of silly bands. Unfortunately this picture represents his mood lately. Tyler has a very sweet heart, but lately he's been a handful. His primary leader said it best today, "He is the sweetest boy. He's just very sweet. But he is still a boy!" We've experienced a lot of changes lately and he seems to be taking them the hardest. Unfortunately he has a serious case of middle child syndrome going on. I'm doing my best to rectify the situation, so hopefully things will change soon. But lately his face looks like this a lot. But despite that look that I see a lot, I love having Tyler around me all day. Sometimes he gets bored, sometimes he gets whiny, but mostly he says funny stuff, he takes good care of his brother, he asks a lot of good questions (in his really cute voice and with his funny inflections), and he points out the obvious--which is always fun. He also doesn't seem to mind that we've given him about 30 weird nicknames (Ty-guy, Tig, Tiggle, Tiggy, Tiggy Wig, etc.). Ah, that's better. Who could not love that face? The thing I know as sure as day, is that our family would be nowhere near as great if Tyler weren't a part of it. He's shown us that every single day for the last four years! Remember a few weeks ago I showed you the bed Jeremy built and I mentioned that he was going to build nightstands next? Well, here they are. Here's a direct link to the plans for the bed, and here's the link for the nightstands (Jeremy changed the measurements for ours). Needless to say, I LOVE my bedroom furniture now (with the exception of the dresser), and it's amazing how I actually want to make my bed now! I was only going to post two of these pictures, but Jeremy likes all three and his response to that was, "You post a million pictures on your blog but you can't just post three pictures for me?" I suppose I can, but he better not ask for anything else for at least a year--he is getting extremely demanding!